Comic book publishers love their big, round numbers. 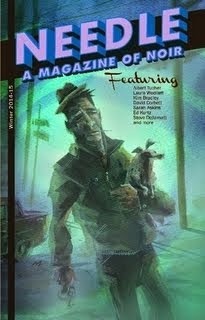 100 issues, 200, 300, 800—these are milestones worthy of celebration, most often marked by oversized issues with major story developments for our beloved characters, while sometimes including bonus material, such as extra short stories or pinups from noteworthy creators in the field. My favorite anniversary issue, as well as one of my favorite comic books, period, is Superman 400, which I wrote about for W27’s 400th post. 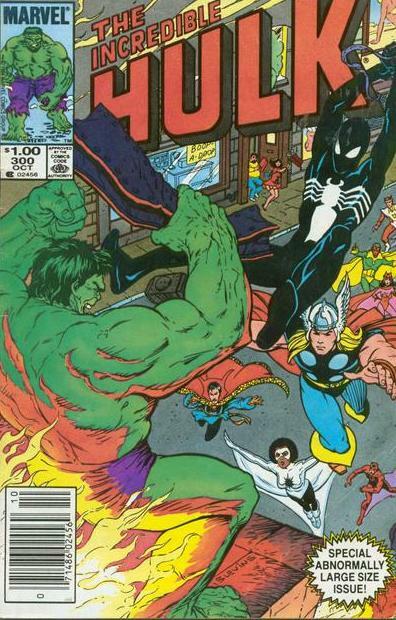 But the first anniversary issue I ever picked up was The Incredible Hulk 300. And it was awesome. 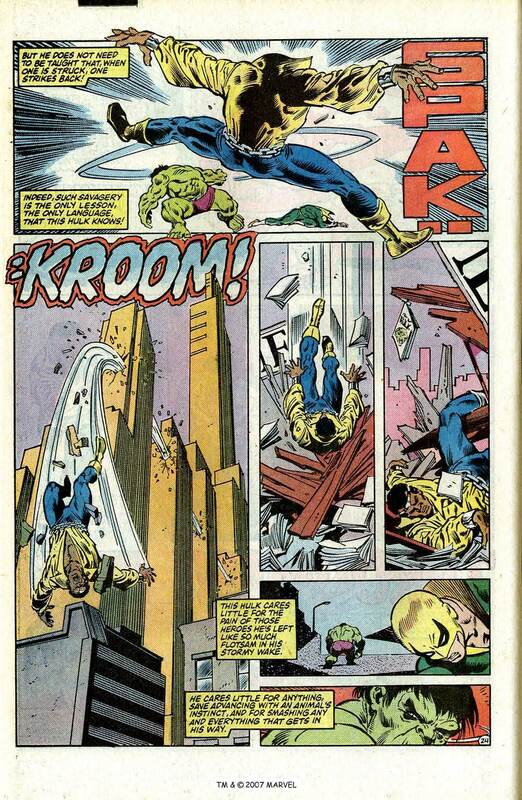 As far as anniversary issues go, this Hulk comic is a benchmark. It is the culmination of a multi-part story arc from creators Bill Mantlo and Sal Buscema that dynamically changes the status quo for Bruce Banner and his alter-ego, the Hulk, in a super-sized climactic issue that has tons of guest stars. 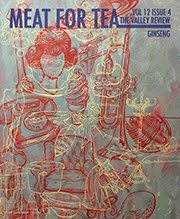 And this comic is packed with action and drama—if overwrought, at times, in the classic Marvel tradition TM—from cover to cover. 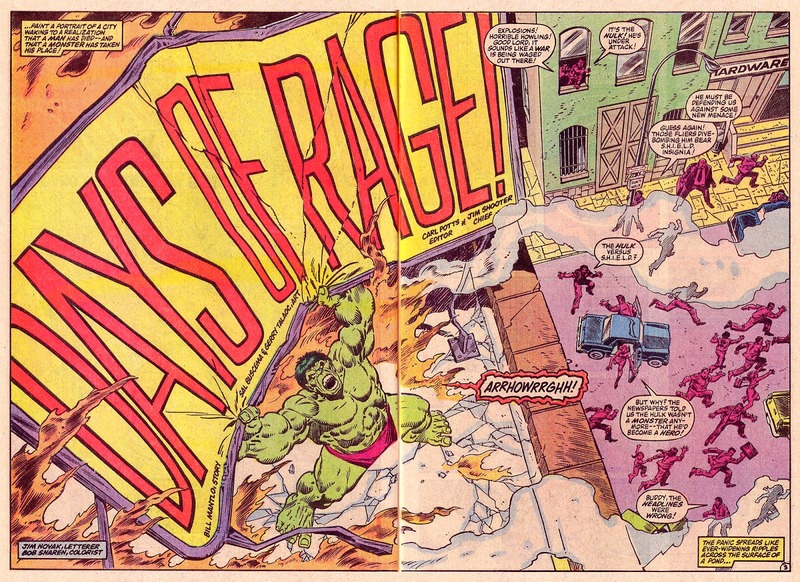 I chose well, when I picked this off the stands, and, in achieving its secondary objective, this story spurred me to start picking up the Incredible Hulk series on a regular basis. 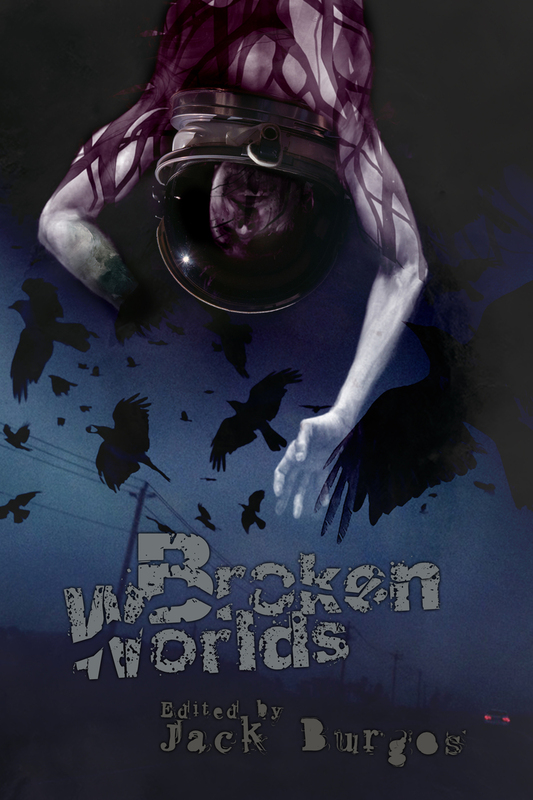 Being the final part of a major storyline, one might assume this would be a difficult issue to read, lacking the context provided in previous chapters. 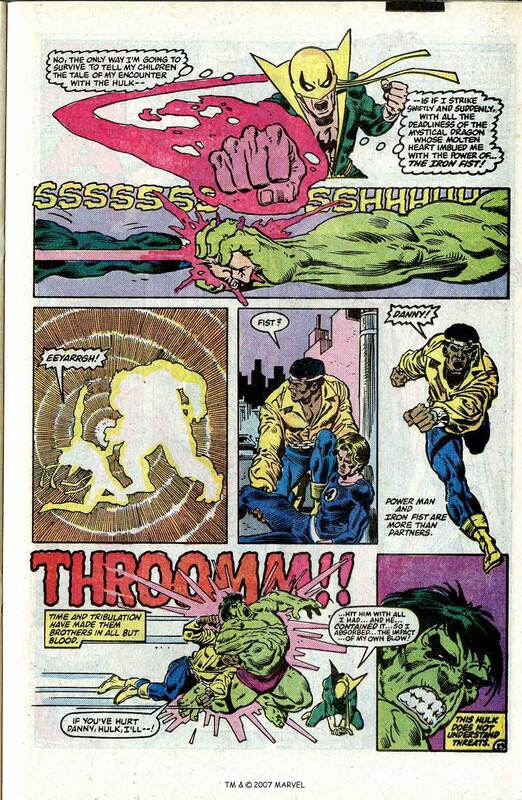 But in recently re-reading Hulk 300, I never found myself lost, and could easily see how a neophyte-me would also have been able to follow the story with ease. 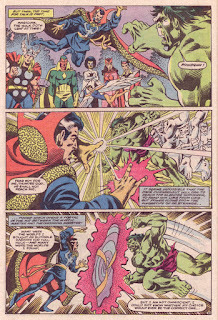 It’s obvious, from page one, that the Hulk is on a rampage—exposition from bystanders gives a fuller context: that the Hulk had recently come to be seen as a hero, that his beastly nature had been curbed by an ability to retain Banner’s knowledge while in Hulk form, and that, somehow, he’s now reverted to the mindless beast he’d often been—and that the other heroes must stop him, lest the Hulk devastate New York and its citizens. 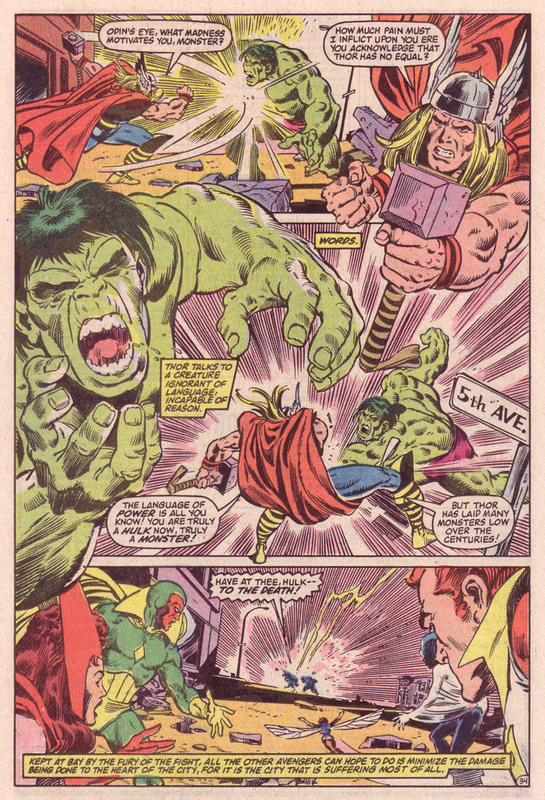 Mantlo & Buscema also provide ample introductions for all the heroes who come together to battle the Hulk, with clear visuals and [sometimes overly] detailed descriptions of their powers. 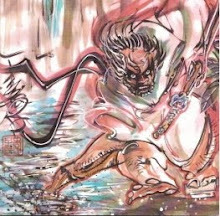 It is a master class in how to write a comic book that is welcoming to both long-time fans and brand new readers—if still in that classic, overwritten manner. 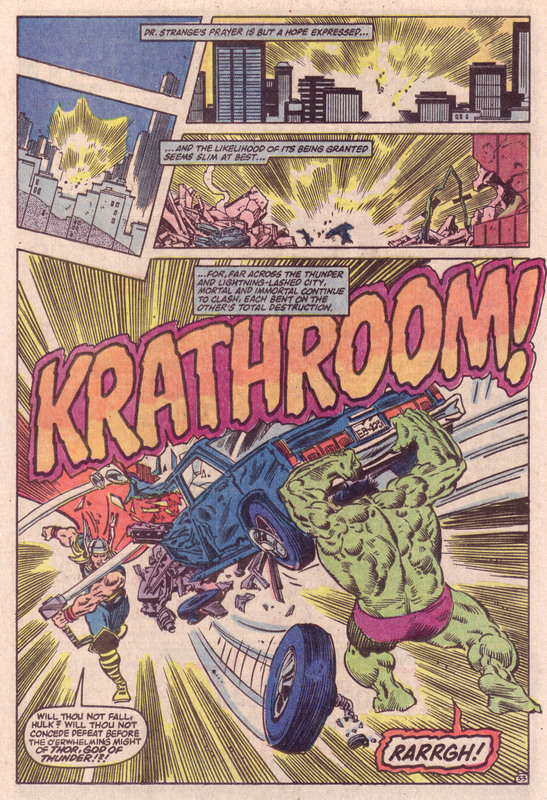 That said, Bill Mantlo is a deft enough wordsmith that—not unlike Larry Hama’s writing for G.I. Joe in this same time period—it does not bog down the momentum of the story. 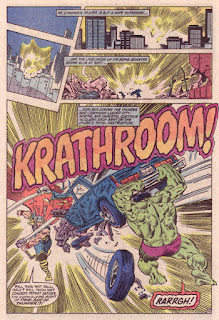 Mantlo’s hyperbole is purple and lush, but it manages to toe that fine line, rarely falling into what feels like parody. 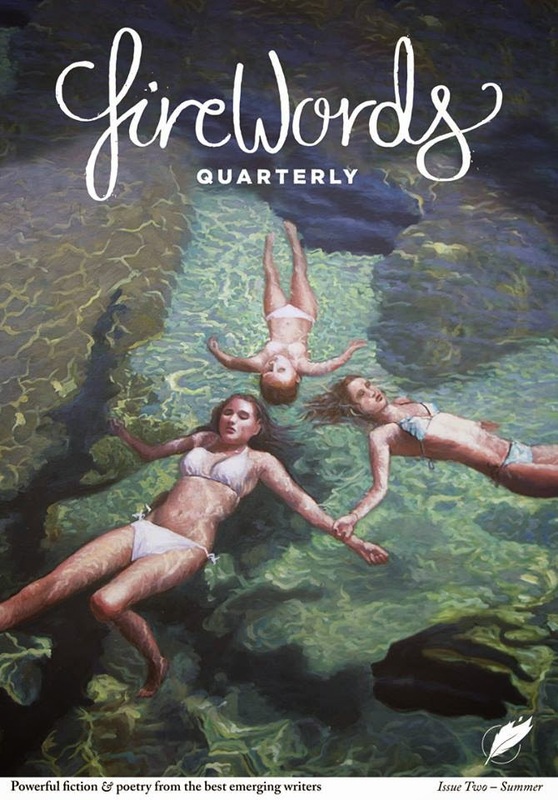 He’s not quite on a level with Alan Moore, whose purple prose contemporaneously dripped off the ink-soaked pages of Swamp Thing, but his lexicon and turns of phrase are engaging and entertaining, adding to the overall feel of the story. It’s impressive. The art in this issue is pretty great too. 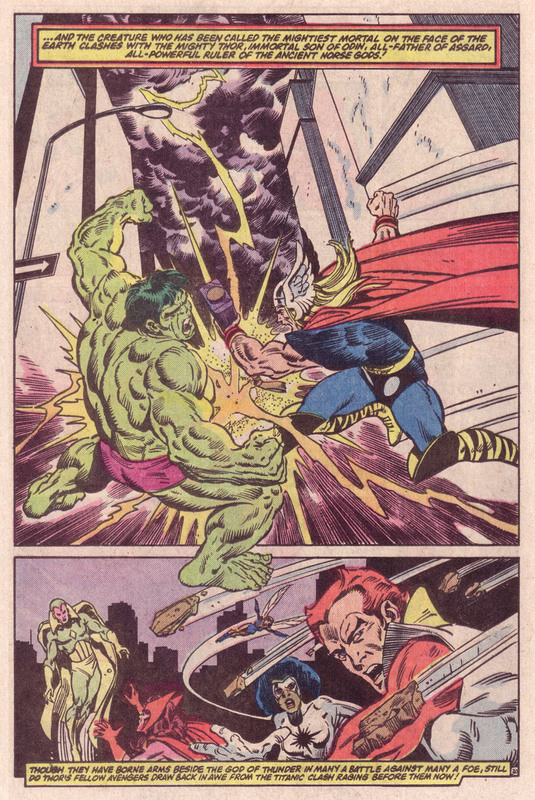 Sal Buscema, a legend in the business, known for his work on a myriad of titles, is not a favorite artist of mine. 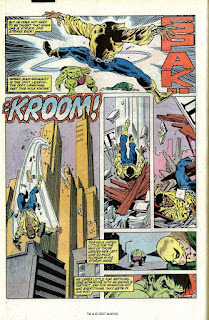 Certainly, his storytelling is clear and his ability to hit deadlines laudable, but Buscema’s art lacked the dynamism and distinctness that his older brother, John’s, art has in spades—at least, to my eye. 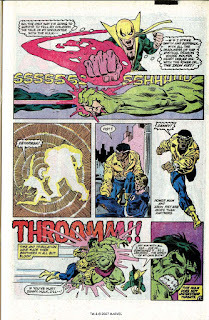 But with this comic, the solid base Sal Buscema provides with his pencils is brought to vivid, dynamic life with the inking of Gerry Talaoc. Where Buscema’s solo work is epitomized by his utilization of heavy blacks for the shading and definition of his characters, Talaoc feathers the heroes in this comic with hatching that imbues the figures with more three-dimensionality and a better realized musculature. With few exceptions [Todd McFarlane being one of them; yeah, McFarlane], the Hulk has never looked better, or more menacing, to my eye. Getting back to the actual story—the climax, one of the most difficult things to do in storytelling, is completely satisfying. After S.H.I.E.L.D. and Thor and the Avengers and Power Man & Iron Fist have failed to stop the rampaging Hulk, Dr. 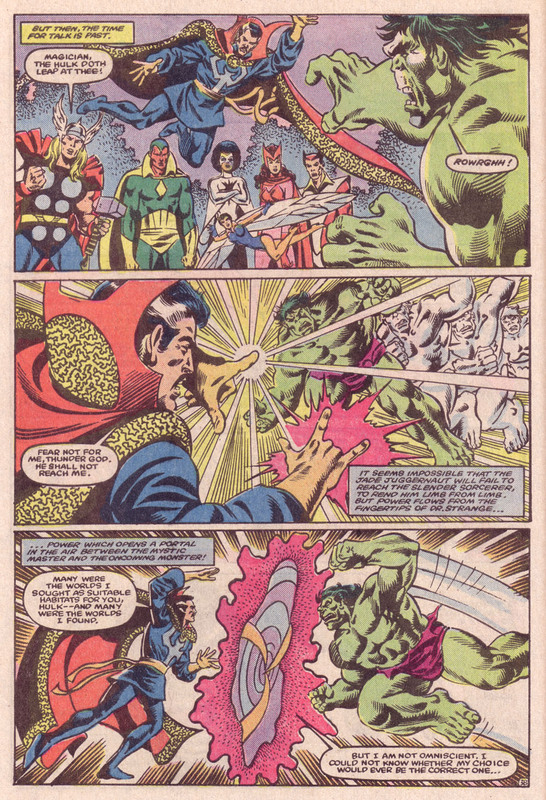 Strange conjures a spell to send the Hulk off to another dimension, where he can no longer threaten Earth. 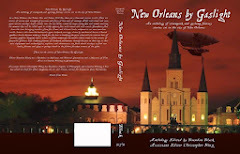 New York City is saved, but the guilt of failing to help their old comrade weighs heavily on the heads of these heroes. In the end, nobody won, except for the readers. 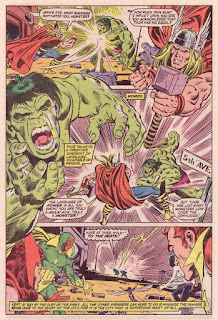 This issue was a celebration of the Hulk’s long publishing history that also marked a new direction for the character, a near-perfect anniversary issue. 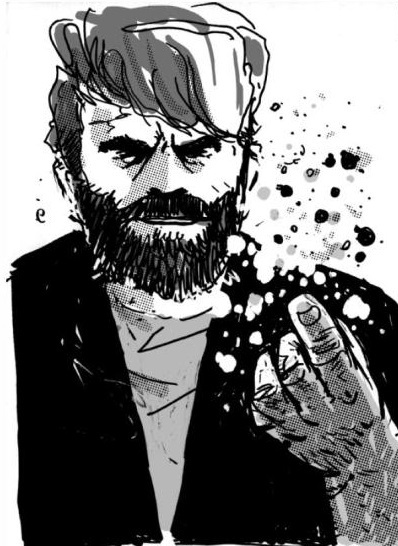 And, it was a damn fun comic to read.